If your favorite test-runner is missing here please feel free to post it in comments. Before shooting from a starter pistol let’s discuss the rules. To make a comparison fair enough I should apply each runner to the same set of tests and with the same running options. But it’s not possible because each runner has own format of tests and own running options. Therefore I will perform some unifications. Actually all tests do not perform any assertions. It allows to measure own test-runner performance cost. At the end I get array of execution time for each runner. These data allows to build a chart. To make a visual representation of the results I will use bar charts. Chart.js library is a great tool for that. All charts are also available online on benchmark’s GitHub page. I will share the link at the conclusion section. I will run all benchmarks on Node.js 7.2 on my MacBook Pro 2,6 GHz Intel Core i5 (4 cpus, OS X El Capitan). All runners are the latest versions installed from npm at the time of writing. For sure, if you run benchmark on your machine — you will get different absolute values. But relative results should be similar. If you get quite different picture feel free to comment. 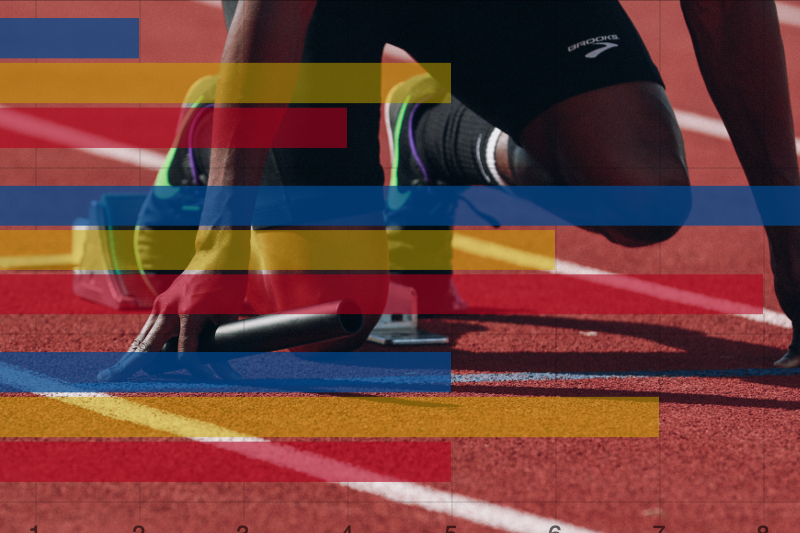 There are top 7 runners with very close time within 0.5 second. Jasmine is the leader with 215 ms. And the other 3 runners (Jest, Tap and AVA) are several times slower. I guess the reason of slowness is that both Jest and AVA are doing Babel transpiling by default. It takes considerable time. Execution time expectedly increased for all runners. And the leadership was taken by lab. But AVA still 3x–5x slower than others (even when I set concurrency=4 that equals to 4 cores of my machine as suggested here). The fastest result is again about ~9 seconds. I’ve looked at several performance related issues in AVA repository. It seems the main “time-eater” is the forking of Node.js process. Also the chart shows that default run of AVA is not optimal — it does not set default concurrency. For the best performance you should set it manually depending on your cpus count. Basically nesting of suites does not have a big performance impact. The result is very similar to the first chart — Jasmine, QUnit and Mocha are the leaders. 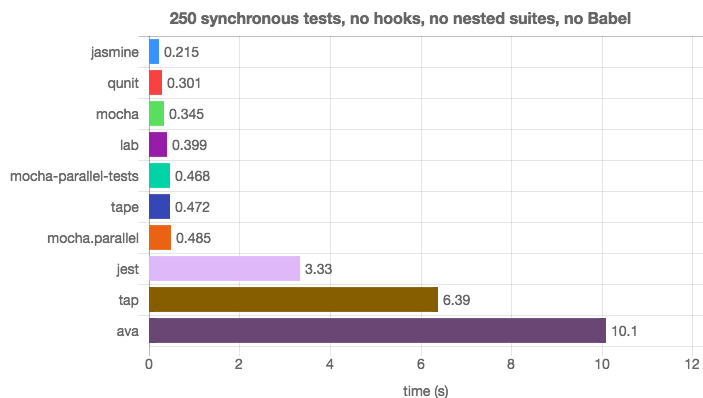 Asynchronous tests can be executed by runner in parallel due to async nature of Node.js. But not all runners support it. For example, Mocha does not support parallel test execution. That’s why I’ve included mocha.parallel and mocha-parallel-tests into the benchmark: they wrap original Mocha and allow to run tests in parallel. Lab is the fastest again. Mocha.parallel and mocha-parallel-tests look very good, but not too far from original Mocha. The picture is similar to synchronous case except QUnit became significantly slower. But real-life tests do not have constant zero delay — actually they take some time. To emulate that I could simply insert Math.random() delay into each test. But this is incorrect approach: random values will differ from runner to runner and the benchmark will not be fair. For true emulation I’ve pre-generated the sequence of random numbers in range of 0–10. 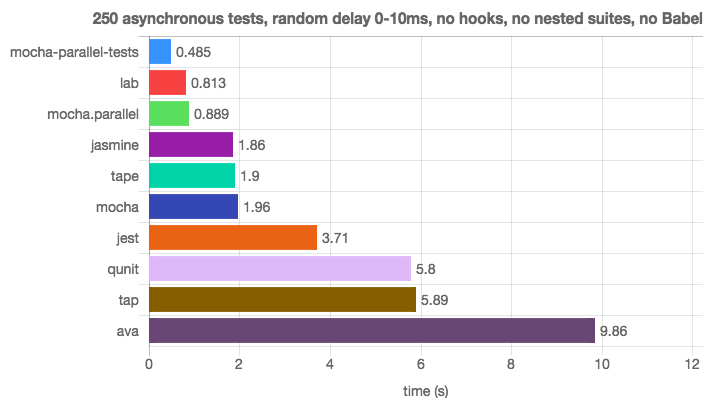 Then I used these numbers as delays in test-files for each runner. This ensures the identity of benchmarks. Here mocha-parallel-tests is the winner. It is 2x faster than the nearest lab and 4x faster than Mocha. Other runners lined up in similar order as in previous zero delay run. The result is very interesting! 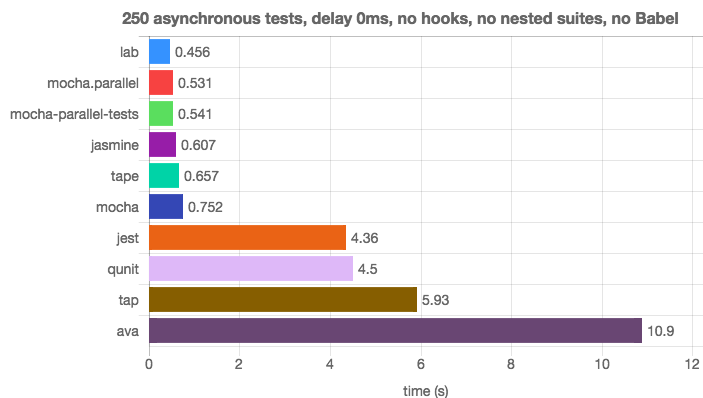 Mocha-parallel-tests executed the job within a second while other runners took 10 seconds, 18 seconds and 61 seconds. To be sure I’ve re-checked several times — the result is persistent. Mocha-parallel-tests definitely deserves attention. Also this is the first case where Jest is faster than Mocha and Jasmine. Despite the fact that Jest performs Babel transpiling. It proves that parallelization and utilizing all cpus are very important for testing real asynchronous code. If you need just fast and simple runner for synchronous unit-testing — the one of time-proven Jasmine / Mocha / tape and a bit younger lab is a good choice. For asynchronous tests you may consider Mocha wrappers like mocha.parallel and mocha-parallel-tests. Lab also shows pretty results. Trendy Jest and AVA are slower in common. But in contrast they suggest many additional features and can significantly improve your testing experience. The benchmark itself is also the tool that can be improved. Each runner offers some additional options for performance tuning. If you know how to boost it— feel free to share. I’ve published all the benchmark code on GitHub. You can play with it locally and build your own charts. I believe it will help other developers to make the right choice and save more testing time. As the time is one of the main treasures in our life!